I read a lot of comments around the Internet about the impending doom of Google Buzz because "nobody uses it". Not only do plenty of people use Google Buzz, it is a vital component to some of Google's other services. If you turn on the Buzz layer on Google Maps, on either the browser version or the mobile version, you will see a lot of Buzz bubbles displayed on the map, depending on where you live. Much of the pooh poohing of Google Buzz has come from social media geeks who don't see any of their regular friends on Google Buzz. Therefore, they assume that if the other geeks aren't there, Google Buzz is a bust. Thus, they haven't invested time in exploring all the options and possibilities of Google Buzz. One of the problems with Google Buzz is that it requires users to use it so it can provide value; this is especially true of the location-based features, which very much requires user data. Unfortunately for Buzz, many locations do not have pre-populated Buzzes. 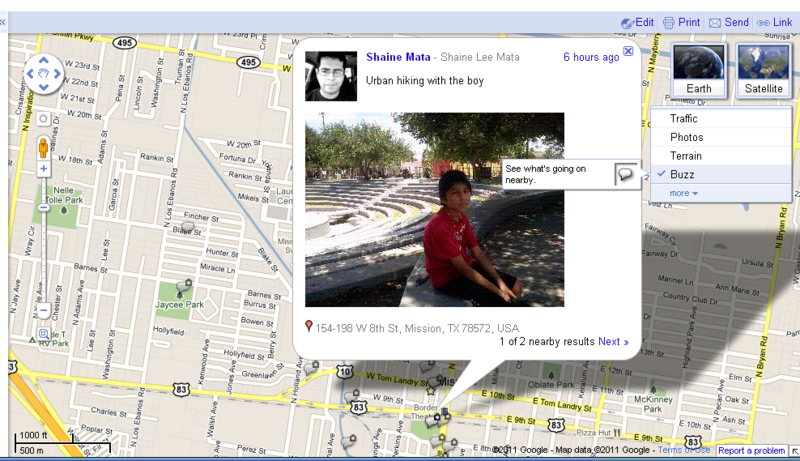 I believe that outside of social media geeks, "regular people" are starting use Google Buzz layer on Google Maps. Many of them are curious what the layer does. Within my own community, there are an increasing number of non-geeks who are popping up in the layer. Some have connected their Twitter accounts, some are posting directly to Buzz. What is really exciting is that they are starting to post reviews of the businesses they frequent. Check-ins aren't as popular, yet. Many of the Buzz posts I'm starting to see come from Maps. Most are from younger people who are commenting on movies they watched, people they are hanging with, status updates, etc. In other words, they are purposely killing time with Google Buzz. Google Buzz is starting to take off under the noses of social media "gurus" because of the crazy popularity of Android phones. Not only do the major carriers have Android phones, now some of the prepaid services like Cricket, Boost, and Virgin have Android products too. Many of the customers who are in the target market don't know, and probably don't care, what Foursquare and Gowalla are. If they don't know, they can't download the app. Thus, they are exploring the features that are already built into their phones. Many of the new users discovering the Buzz layer may not know that they can use Buzz from their Gmail account. In fact, they may not know that it's an option. As a "Wall", Google Buzz may not see that much adoption. Outside of keeping an eye on what people are saying about your establishment, the Buzz layer is a great visual way to reach out to customers. Even if you don't know how to claim your Google Places location and set up Adwords, you can post specials, photos, messages, and communicate with public with Google Buzz. You can even communicate directly with past customers by sending them an @. Customer checks in or comments at your location. Thank the customer for their patronage, follow them on Buzz. Offer coupon via email. Add customer email to a list in your contacts, which Google calls Groups. Send out Buzzes on occasion to your customer Group, public or private with comments on or off. Create a VIP Group of customers who get the "special offers". Market to them too. Google has made building your customer list super easy through a product, Maps, which you would never imagine is a social medium. Best of all, Buzz goes directly to email in-boxes...on their phones.